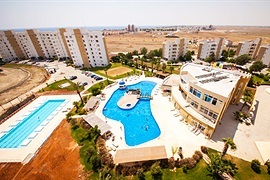 Holiday villas to rent in Famagusta town, Bogaz and Karpas Peninsula. Bogaz is a sleepy village where you can still buy fish fresh from the boats that bob in the harbour, and with wonderful views across the wide sweep of Famagusta Bay. Bogaz is the gateway to the beautiful Karpas Peninsula to the east, with its deserted beaches, and to the fascinating history of Famagusta and Salamis to the south. Famagusta is a town that's seen life over the years. The old Venetian walled city with its famous Othello Tower was besieged by the Ottomans in 1571s, who starved out the occupants before taking over the city's fine buildings. Today, Famagusta is a bustling town, an ideal base for exploring the east side of North Cyprus without leaving the comforts of town living behind. The best part of a villa holiday in Bogaz or Famagusta is that the delights of the Karpas Peninsula are just a few miles' drive away. Pretty Bogaz village makes an ideal base for exploring this fascinating place. The Karpaz is a panhandle of land jutting into the sea, with lush green fields of tobacco, vineyards and groves of olive and carob trees. Keep heading east, and it changes into a spectacular rocky landscape where the grumpy Cyprus wild donkey is king, sharing the land with migratory birds, nesting sea turtles and a huge variety of native wildlife. You are also close to some of the finest beaches in North Cyprus, and none of them will be even remotely crowded - the Karpas Peninsula has over 45 sandy beaches to explore on your North Cyprus villa holiday! Unspoilt Bafra Beach is right on your doorstep at Bogaz. At Famagusta, Glapsides Public Beach is popular with families, where youngsters can paddle safely in the shallow waters. Head into the Karpas Peninsula to discover secluded rocky coves that can be yours for the day, or the wide sands of glorious Golden Beach. Backed by romantic sand dunes, chances are you'll be the only family on your stretch of this enormous sandy beach, unless you count the sea turtles laying their eggs in the sand! You are spoilt for choice when it comes to exploring history when you enjoy a North Cyprus villa holiday in Bogaz. The village is just five minutes from Strongylos Castle, a Byzantine watchtower with links to the Knights Templar. Venture into the Karpaz Peninsula, and you are going back even further in time. Here, prehistoric peoples built villages on the rocky peninsula long before the Byzantines added their elegant churches, now atmospheric ruins that you almost stumble across on your way down to a beach. Head to the far end of the Karpaz Peninsula to discover the Apostolos Andreas Monastery, where St Andrew arrived on North Cyprus and created a fresh water spring, said to have healing properties. Bogaz bars and restaurants are busy with locals and tourists alike, and the supermarket has everything you'll need to stock the fridge at your North Cyprus holiday villa kitchen. If you prefer not to cook on your North Cyprus villa holiday, try one of the excellent fish restaurants on the harbour such as the Bogaz Garden. Visit Kemalin Yeri for a traditional Turkish Cypriot lunch or The Moon for unbeatable Sunday roasts with the ex-pats! On your North Cyprus villa holiday in Bogaz, make sure you have time to walk through the old town of Famagusta, spotting a Venetian palace here, a Gothic cathedral there, and the odd cannonball still left over from the siege of 1571! Or walk in the footsteps of Romans at the ruined city of Salamis, complete with its amphitheatre, gymnasium and Roman toilets that kids find totally fascinating! If you love getting under the skin of a country, there can be no better place for a North Cyprus villa holiday than friendly Bogaz and fascinating Famagusta. This page is prepared in 292 ms.